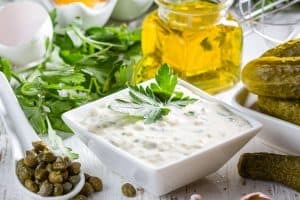 Best Alfredo Sauce Recipe. How to make in quick and easy steps. 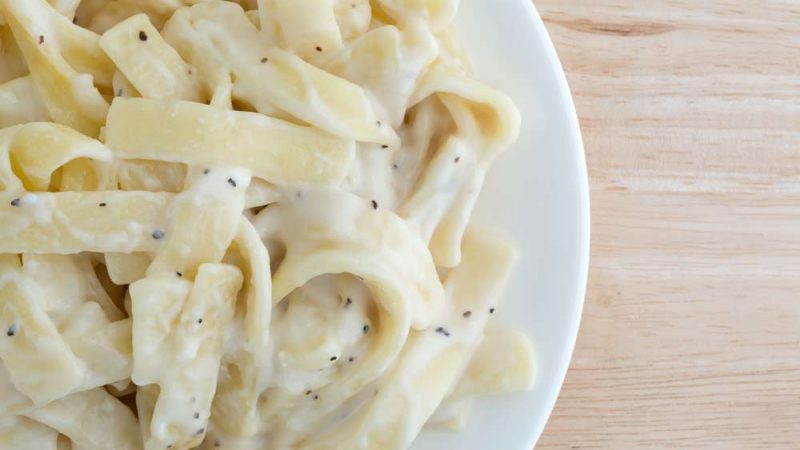 Do you know how to make Alfredo sauce? We invite you at this marvelous moment to know each step to prepare this delicious and simple recipe. 1 Origin of Alfredo sauce. 1.1 When Alfredo sauce became famous? 2 Alfredo sauce for pastes. 2.1 All contain Alfredo Sauce. 3 Alfredo Sauce, the original recipe. This deliciousness origínated in Roma and reached its fame in Alfredo restaurant, there Scrofa, after that the chef and owner of the place, Di Leilo should prove a variant of the sauce to serve to his wife. 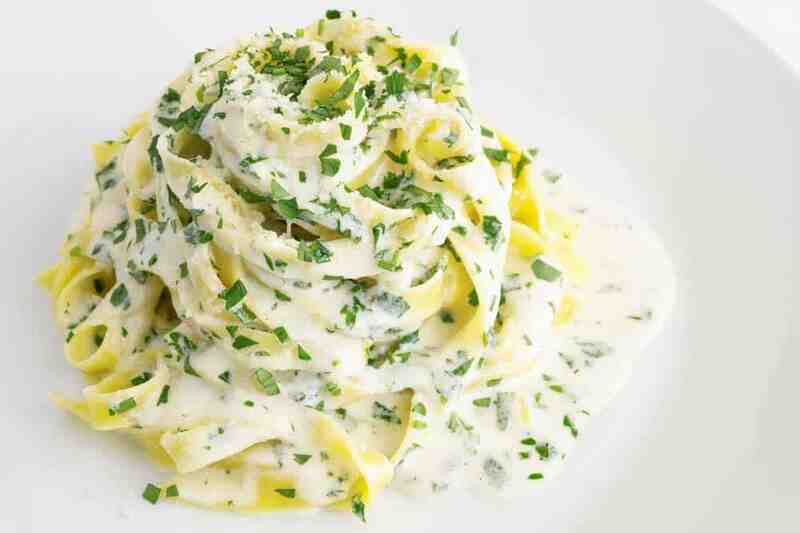 The original Alfredo sauce came up in 1924, and it is similar to the famous fettuccine and butter. By that time , was called like this because at the time to place them in a bowl to taste some butter was add right after and before. It was the method known like doppio burro, what means in Spanish double butter. It was then, when Dileilo thought to double the amount of butter before serving the fettuccine for that his pregnancy wife could digest it easier. That is right, in this way begins to get popular the sauce that Alfredo use to serve. When Alfredo sauce became famous? A few time later, a couple of lovers tasted this dish and kept delighted, so that, as gratitude, gifted a gold spoon and fork to the chef. The present contained a photo of the newlyweds and it was hang as a decoration in the restaurant. The couple kept so impress with the delicious taste of the fettuccine with Alfredo sauce that learned the recipe and cooked to some of their friends from Hollywood. From this moment, it became in a very popular classic Italian – North American dish and usually consume in the United States. Besides of famous all over the world, with the time was earning field and nowadays, it is known in all the countries. Generally, that recipe, always goes accompany of some paste, it is like an accompaniment that of course, you can add more ingredients. It is according to the taste of each, and the preferences of our guests when we are about to prepare them a nice dinner. If you want to impress to everybody, with the eyes closed, recommend you any recipe that contains Alfredo sauce. It is a combination that will never disappoint you and it will make you look in your celebration, besides of the advantage that it has, that is that it is not necessary to make a great effort neither being for long hours in the kitchen. With just a few steps and in a brief period you will have your dinner ready to be enjoy it by everybody. Here you are some suggestions of dishes that you can prepare all of them delicious, dare and make some of these recipes. Zucchini paste with vegan Alfredo sauce. Alfredo Sauce, the original recipe. Alfredo sauce original recipe contained in its beginnings just parmesan cheese and butter. Through the time, many chefs decided to modernize it a little by adding milk cream. Today, it is very common to find someone interested in how to make this Sauce, so that it is as popular as delicious. The Best of all is that it is not necessary to be a professional chef to prepare this recipe, because is so simple that we all can easily make it at home. In this sense, we can also put it our personal contribution, yes, it is not to be worry about it, so that there are many versions about it. For instance, in some cases you can include it garlic, or vegetables, as well as parsley, chicken, some seafood and everything that comes to your mind. Alfredo Sauce one of the favorite to combine with pastes, especially with fettuccine. It is a classic of the Italian food, super creamy and with some variants , all of them delicious. Melt the butter in a Frying pan or Casserole. Then, add little by little the milk cream and stir it constantly with a spoon made of wood; otherwise, you can use the one at your hand. Finally, add the parmesan cheese, the salt and the pepper, let to cook it over low flame from 5 to 10 minutes, untill it gets the consistency that want. And ready our basic Alfredo Sauce is prepared. As we said, there are millions of variants of this recipe, one of them, that we also like so much like the original recipe, is this one that we tell you now. You can add it 2 teaspoon of olive oil at the time of melting the butter, and then to add ½ spoon of garlic in powder or 2 well crushed cloves of garlic. 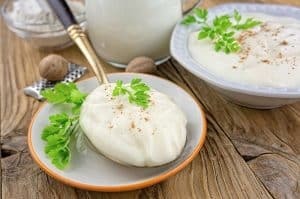 In the same way , add the cream milk and the parmesan cheese and stir for about 10 minutes, at the end if you prefer , you can also throw it ½ glass of grated mozzarella cheese and continue stirring until it totally gets melt. The result is delicious and creamy, it is for 4 portions and it can be serve accompany of the paste that you choose .